I read this article and found it very interesting, thought it might be something for you. The article is called Tibetan Parliamentary delegation successfully concludes the South-India Tibet-Advocacy Campaign and is located at https://tibet.net/2018/11/tibetan-parliamentary-delegation-successfully-concludes-the-south-india-tibet-advocacy-campaign/. Tibetan parliamentary delegation Pema Delek, Migyur Dorjee, and Namgyal Dolkar Lhagyari presenting memento to the Kerela Chief Minister Pinarayi Vijayan. Kerala: The Tibetan parliamentary delegation, who has been advocating for the cause of Tibet in the southern states of India., viz., Karnataka, Puducherry and Tamil Nadu, has successfully come to its final leg of the journey at the state of Kerala, where they called on its Chief Minister, Speaker and other state-level officials from 16 to 21 November. The delegation comprised of Parliamentarians Pema Delek, Migyur Dorjee, and Namgyal Dolkar Lhagyari has arrived at the capital city of Kerala, Thiruvananthapuram, in the morning of 16 November after their departure from Chennai, Tamil Nadu. The next day on 17 November, they called on Sh. Kodikunnil Suresh, MP and Working President of Kerala Pradesh Congress Committee (KPCC) and Sh. Sasikumar, Member, Kerala Pradesh Congress Committee. The delegates apprised before them the agenda of their visit and entreated them for their support towards the cause and issues of Tibet. Thereafter, from 19 to 21 November, they called on Sh.V.K Babu Prakash, Secretary, Kerala Legislative Assembly, Sh. P. Sreeramakrishnan, Speaker of Kerala Legislative Assembly and Sh. Pinarayi Vijayan, Chief Minister of Kerala respectively. On 19 November, in accordance with the directive from the office of the State’s Legislative Assembly, the delegation was taken for guided-tour to its House and the Kerala Legislative Assembly Museum, the huge edifice which is a repository of the legislative history of Kerala, located right inside the assembly complex by its Protocol Officer. That particular day, being the birthday anniversary of former Prime Minister of India, late Smt. Indira Gandhi, the delegates paid a courtesy call to the Kerala Pradesh Congress Committee and paid their respects. The day before on 18 November, the delegates had met with the Tibetan shop owners at Varkala as solicited by them days before. They were received by Acha Ngawang and were also accorded a humble lunch in their honor. With the five-points appeal for Tibet as the principle solicitation, the delegation apprised the respective leaders on the urgent situation inside Tibet and the deteriorating human rights situations there on a daily basis; the essence of Tibetan struggle and the aspirations of His Holiness the Dalai Lama as well as on the official policies of Central Tibetan Administration etc. They further entreated them to bolster the participation of Indian parliamentarians in the All Party Indian Parliamentarian Forum for Tibet (APFPFT) and to propel assiduously towards the protection of human rights in Tibet while congratulating them on India being elected as the member of United Nations Human Rights Council. The delegation also presented them with the Five-Points appeal of the Tibetan Parliament-in-exile and other Tibet-related publications. Recounting speeches of His Holiness the Dalai Lama on the philosophies of Buddhism and Communism, the delegation, in particular, drew many parallels between the two during their meetings with the Hon’ble Chief Minister and Speaker, both of whom belongs to the Communist Party of India (CPI). While calling upon the respective states’ Governors, Chief Ministers, Ministers, Members of Indian Parliament and Legislative Assemblies as well as other dignitaries for over 21 days of the Tibet-advocacy campaign in the southern states’ of India., viz., Karnataka, Tamil Nadu, Puducherry and Kerala, the Tibetan parliamentary has expounded on the achievements and aspirations of His Holiness the Dalai Lama and the possibility of their audience with the respective states’ leaders owed solely to His Holiness. Not only were the Tibetan parliamentary delegation accorded a warm reception and a generous time, but also the appeals of Tibetan parliament on Tibet were regarded with utmost significance by the respective leaders. The 21 days Tibet advocacy campaign from 1 to 21 November, thereby, came to its final leg of the journey and simultaneously, concluding the nation-wide Tibet-Advocacy campaign by the 16th Tibetan Parliament-in-exile. Tibetan parliamentary delegation Pema Delek, Migyur Dorjee, and Namgyal Dolkar Lhagyari presenting memento to the Speaker P Sreeramakrishnan. 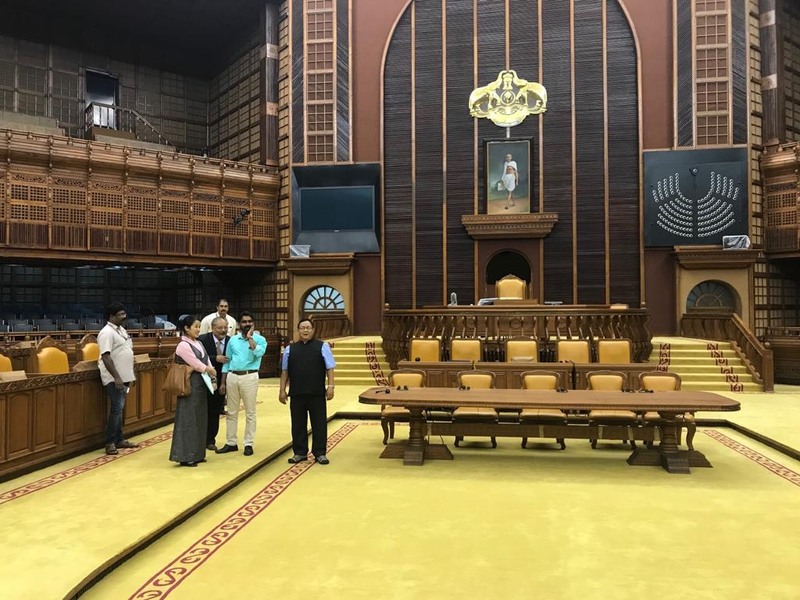 Formal tour of the Kerala Legislative Assembly for Tibetan parliamentary delegation Pema Delek, Migyur Dorjee, and Namgyal Dolkar Lhagyari.